Has it really been five years since Turbine took the world's most beloved fantasy world and transformed it into a massively multiplayer online game adored by a handful of players until it went free-to-play? Well I sure hope so; otherwise this post is pretty pointless. 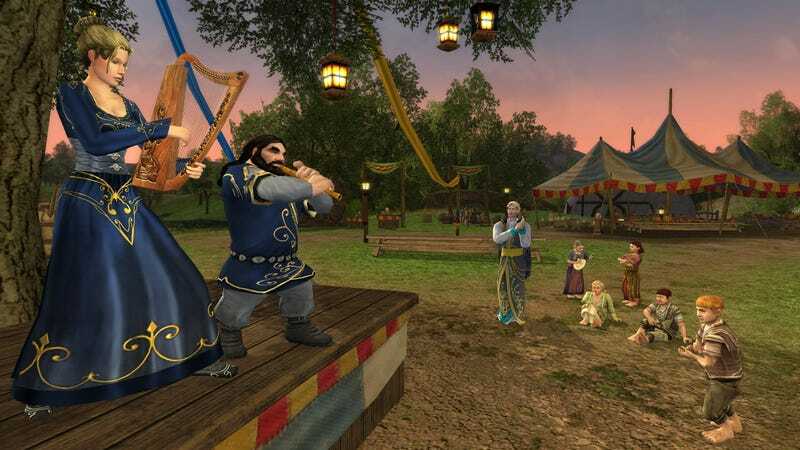 Lord of the Rings Online launched on April 24, 2007, ushering a new age of peace and prosperity amongst the elves, dwarves, humans and hobbits of the internet. Characters were created, levels were earned, music was played and monsters were battled (or battled as). Things slowed down a bit for a while there, but the move to free-to-play in 2010 brought the game back to life, making it the third most played MMO in 2010 (according to the NPD group). So here we are, nearly five years later, with Turbine kicking off a festival to celebrate the milestone, running now through April 30. Along with free fireworks for everybody, players will also receive gifts based on how long they've been active in the game, ranging from a festive cloak for one-year subscribers to a sweet horse for those that have stuck around for all five. Hit up the official website for more on what's going down in Hobbit Town in celebration of still being a thing in 2012.